In this project, we were asked to do a photoshoot for a combination of spoons of different sizes. Our client sells it as a combo and not as a single piece. 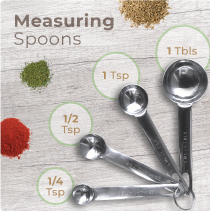 So, we have come up with capturing the four different products as a grouping product shoot with the naming of each spoon’s size. Buyers can get a clear image of what the product is and the different sizes included without worrying about the description.